Incidents in the short program can have a dramatic effect on the overall standings, as US men’s skater Nathan Chen knows only too well. And the drama in this competition really began when Gabriella Papadakis suffered a wardrobe malfunction only seconds into her short routine, when her dress came undone. She completed the program with partner Guillaume Cizeron to score 81.93 for France, enough for second place overnight behind their training partners Tessa Virtue and Scott Moir of Canada with 83.67. The compulsory Latin music theme of the short program didn’t seem to suit the French couple quite as much as the classical piece they were at liberty to choose for their free routine. Papadakis & Cizeron performed to the ethereal piano Moonlight Sonata whilst Virtue & Moir in complete contrast skated to Moulin Rouge a full-on “in your face” ballsy number. In a way the music chosen by each couple seemed to reflect their personalities and partnership dynamics. The Shibutani siblings for team USA looked to be really enjoying their Coldplay music inspired routine, and as always gave a technically sound performance, if a little clinical looking, compared to the French and top Canadian couples. That precisely executed program won Maia & Alex Shubutani the Bronze for the US (overall 192.59) with fellow Americans Hubbell & Donohue closely behind in 4thafter a slightly disappointing free program. Papadakis & Cizeron free performance was exquisite with a ballet-esque like quality yet displaying elements of contemporary dance as well. Similar to Hanyu in the men’s individual, the French couple seemed at one with the music, and more importantly with each other. They moved as one entity with an ebb and flow so quiet, delicate and beguiling, it was captivating to watch. Their routine scored 123. 35 a new World Record for a free program in ice-dance. Later Virtue & Moir took to the ice to perform like a couple possessed. They demonstrated passion, drama and athleticism that could make your head spin, but delivered subtlety in quieter moments too. Perhaps this light and shade element to the Canadians routine gave them the overall edge, as commentator Robin Cousins suggested both couples had the same base line score of 44.90 to begin with. But with a combined score of 206.07 (overall World Record) Virtue & Moir took Gold for Canada with Papadakis & Cizeron taking Silver for France with 205.28. Couples vying for places outside the medals that impressed me included 8th placed Gilles & Poirer of Canada who performed to Bond music and their teammates Weaver & Poje in 7th who gave a dramatic and powerful routine. British couple Coomes & Buckland came in a credible 11th an impressive achievement considering Penny suffered a potential career ending knee injury in 2016. OAR skater Evgenia Medvedeva suffered a broken foot that interrupted her Olympic preparations, and she changed her free program midseason to a routine that “made her feel something”. Having not been beaten in competition since November 2015, Medvedeva tasted defeat to her compatriot Zagitova in January 2018. Would the same thing happen again in PyeongChang over the top two spots, and who would fight for the Bronze? After the short program the three Americans were ranked 9th-11th a little disappointing for them, especially after Nagasu fell on her triple axel jump having become the first woman to land it in the team US skate. The top six overnight included the two OAR athletes, two Japanese (Sakamoto 73.18 & Miyahara 75.94) the Italian Kostner with 73.15 (Celine Dion music) and Canadian Osmond 78.87 (Edith Piaf music). Evgenia achieved a world record in her short program with 81.61 only to watch her teammate Alina surpass this with 82.92, having performed the most difficult triple Lutz/triple loop combination in the women’s competition. Kostner made several uncharacteristic errors in her free routine making her performance seem a little laboured, especially without any triple/triple combination jumps. But all credit to the Italian for still competing at age 31, more than double that of Alina Zagitova aged just 15. Both Japanese skaters put in beautiful routines, but neither could equal the achievement of Canadian Kaetlyn Osmond’s Black Swan performance that took Bronze (231.02). Her free routine scored a fantastic 152.15 a seasons best by a whopping ten points, duly rewarded for her quality skating, the speed and flow over the ice and the dramatic performance. Not as technically loaded as the OAR routines but terrific to watch, especially as the Canadian provided a stark contrast of style. When Zagitova took to the ice the difference was obvious, as Alina loaded her routine into two distinct parts, choreography, spin and steps concentrated into the first segment, followed by jumps in the latter half. She did this in the short program as well, a clever move as later jumps are given a 10% extra mark. Having watched the others who spread the technical elements throughout their routine, it did make the Zagitova free program look unbalanced. Alina showed some quick thinking however, when a triple Lutz/triple loop combination turned into a triple/single one, and she just added the original element of difficulty very late in the program. Her free score of 156.65 indicated that was probably a good move. Evgenia Medvedeva was the last to perform in the Olympic figure skating competition. Her routine was wonderful to watch, seemed more balanced as a whole, the skating was faster, the jumps a little higher, and more ice was covered than Zagitova. But the biggest difference between the OAR performances was the facial expressions of Evgenia, so distinctive, illuminating and emotive. She told a story through her expression and body language. For me and much of the audience Medvedeva was the gold medallist. But alas the judges deemed Evgenia’s free program equal to Alina’s and scored it 156.65 as well. So the two world record short program’s decided the final outcome with Alina Zagitova taking Gold and Evgenia Medvedeva the Silver for OAR. In closing, the Pairs winners Shavchenko & Massot had completeness within their free program, with a seamless quality between transitions. Hanyu inhabited his music in the men’s individuals as did Papadakis & Cizeron in the ice-dance. But the extra dimension of light and shade from Virtue & Moir brought them gold. The women’s individual program had light & shade, storytelling & emotion through Osmond and Medvedeva and technical awareness and grace from Zagitova. 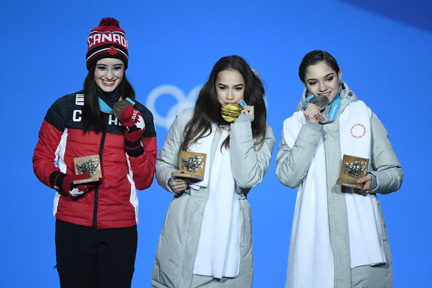 But the small age difference between the medallists was telling, as 18 year old Medvedeva and 21 year old Osmond had the extra maturity to express their programs better. Yet Zagitova had that youthful fearlessness where the technical elements were concerned. Alina’s emotional expressiveness can only get better through maturity and Kaetlyn can add to her technical diversity. But for me the winner in PyeongChang was Evgenia Medvedeva who said in an interview with the BBC “I left all my soul in the competition”. It showed and I felt it. Wow!! !